It seems like everything in today’s economy is shifting to an on-demand model accessed digitally, so why not have the role of CIO accessed the same way? The on-demand or sharing economy model that’s eating the world and counts success stories like Uber and AirBnB as its bannermen is what inspired Andrew Dillane to ask that question. The former president of the CIO Association of Canada (CIOCAN) and former CIO of Randstad Canada feels the answer to it is his new business – DigitalCIOs Inc. You just have to look at the numbers to see how the idea makes sense, he says, as there are a few thousand CIOs in Canada, but many more businesses that could use one. The reason for this is often a breakdown of communication between business executives and the IT leaders at smaller companies, Dillane says. That’s the sort of thing a CIO could help to fix. He realized the problem after speaking with smaller organizations around the world, including many executives in The Netherlands while he was doing work in the venture capital community. He’s not the only one to notice a talent shortage. 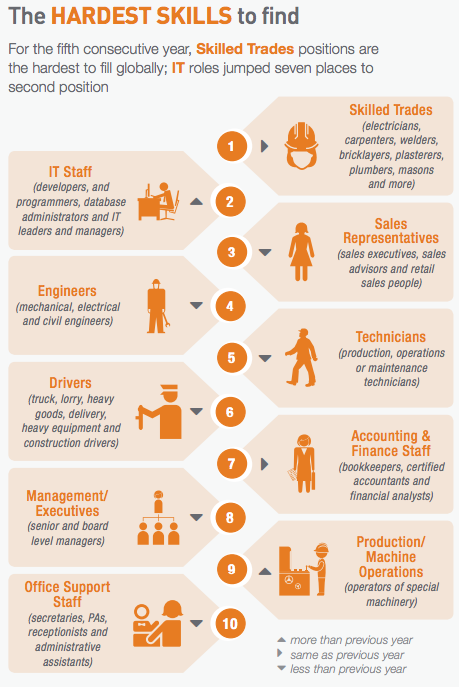 ManpowerGroup’s 2016/2017 survey ranks IT staff as the second most-difficult type of job to fill globally, right behind skilled trades. That was a jump up from ninth place the previous year, and includes developers, programmers, database admins, and IT leaders and managers. Dillane realized he could use his connections with other former CIOs to address that talent shortage in a unique way. The goal of Digital CIOs will be to pair clients with a CIO that will take on a part-time and long-term role with that organization. The CIO could contribute one or two days a week, or perhaps one or two days a month, depending on the needs of the client. It’s not just about deploying that ERP system and parting ways, Dillane says, it’s about facilitating long-term change. Given that 28 per cent of employers worldwide are considering exploring alternative sourcing strategies to shore up their in-house talent, that sort of arrangement may be palatable for many businesses. Dillane thinks clients will be able to trust their part-time CIOs just as well as a full-time employee when they see the value they can bring to the table. Often business leaders are surprised that CIOs bring more than just a technological skill set. Plus, clients will have access to a larger brain trust once Digital CIOs onboards more CIOs for hire. He expects small to mid-sized organizations that are going through a lot of change, or dealing with merger and acquisition type of activities.